Looking for excellent canoeing and kayaking areas off the beaten path? Iron County is where you'll find them, wrapped in the color palette of the season. Whether you are a novice or looking for an "extreme" experience the Mercer area has what you've been looking for. The 19,000 acre Turtle-Flambeau Flowage was created in 1929 and encompasses 9 original lakes and 150 miles of pristine shoreline. Much of the lake and campsites on the Flowage is owned my the Chippewa Flambeau Improvement Company. Fishing is usually superb for walleye, musky and northern. Eagles, osprey, and loons are commonly seen. The Flowage can be thought of as two bodies of water: the eastern side from which the Manitowish River enters, and the western side from which the Turtle River enters. Primitive campsites are available on the Flowage's many islands on a first come, first serve basis. Most do not have water. Be sure to bring your own or carry water purification gear. Please pack-out all your garbage so that these islands remain open to public use! Bring a good map and compass. It is easy to become confused among the many islands and inlets of the Flowage. Keep a close eye on the weather. The Flowage is a large, shallow body of water that can kick up some wild waves rapidly and leave the unwary paddler far from shelter! Detailed maps of the Turtle-Flambeau Flowage are available on request. as well as our canoeing/kayaking guide, "Rivers Through Time", at the Mercer Chamber of Commerce. Manitowish Route through the Flowage From Murray's Landing to Turtle Dam-Eastern Portion of Flowage. Total: 9 1/2 miles Murray's Landing, a well-marked public boat landing, is a favorite put-in for paddlers wishing to explore the Flowage. Murray's Landing is connected to Hwy 51 via Murray's Landing Road, 1/2 mile west of the town of Manitowish. Be aware that this route can provide navigation challenges different than river or lake paddling. Flowage water levels fluctuate. Channels and bays open during normal water levels may be grass-covered and hidden at other times. A good map and compass are a must! Continuing from Murray's Landing, generally follow the right or north shore, but avoid paddling into the first large bay to the fight which his a dead end. After passing this bay, keep close to the fight shore and pass through the "narrows" between an island and the mainland. An old hermit who used to entertain canoers with legends of the Flowage once lived here. Once past the narrows, you will enter the main body of the Manitowish-Flambeau River portion of the Flowage. Look for a gumdrop-shaped island, higher than the others around it. This is Bonies Mound. The islands around Bonies are suitable camping and picnic sites. The route continues west from Bonies following the original channel of the Manitowish River, passing through another set of "narrows" before turning south at the outlet of Blair Lake. 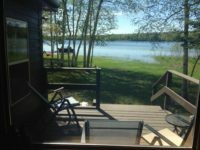 A boat landing and campsite are located along the north shore approximately 2 miles from Blair Lake. Once into the main body of this section of the Flowage, head southwest. There are several good campsites along the route. The second site from the north end of Hot Dog Island is favorite. kayak_2Portage right at the Turtle Dam over the dam's dike, about 500 feet west of the dam's gates. A portage of 200 feet leads you back to the water. There is no boat landing below the dam. You are now on the shores of the North Fork of the Flambeau River. Put-in below the dam and head left to the main river channel going through Haystack Rapids, a twin set to Class I rapids. The first is low hazard, the second pitch more challenging. A public boat landing is located on the right shore just after the rapids. Turtle River Route Through The Flowage Lake of the Falls County Park at Co. Hwy. FF to the Turtle Dam-Western Portion of Flowage Total: 8 1/2 miles The Lake of the Falls put-in will give you an easy one-day access (8 1/2 miles) to the Turtle Dam via the Turtle River route on the west side of the Flowage. The Turtle is a faster river coming into the Flowage then the Manitowish which enters from the eastern side of the Flowage. Fishing is usually good along this route. Downstream 1/2 mile from Lake of the Falls the river widens into "Sturgeon Bay" and passes to the right (west) side of Big Island. This is the original route of the Turtle River before it was flooded when the Flowage was created. A rustic campsite can be found just left of mid-channel about 4 miles downstream from the put-in. A short-cut under a low bridge around the east side of Big Island is an option. As the route turns southeast, you will pass through Lake Bastine, one of the 9 original lakes flooded when the Flowage was created. Many fine resorts, dining and lodging establishments can be found here. A public landing is on the right shore as you leave Lake Bastine. This landing is about 2 miles from the Turtle Dam or take-out below Turtle Dam as previously described. The North Fork of the Flambeau River is a fast, exciting trip with many Class I and II rapids and several Class III rapids. Water levels can fluctuate on this stretch. High water increases the hazard of rapids while low water increases the opportunity of hitting rocks. The paddlers should consult a more detailed water trail guide of this route to help in scouting the rapids. The trip can be a fast 1-day or a more leisurely 2-day paddle. It is generally a 6-hour trip. The put-in is at the public boat ramp below the Turtle Dam and first pitch of Haystack Rapids. The river will narrow quickly to 25 feet dropping rapidly at Notch Rapids (Class III). The current will tend to slam you into the rock wall on the outside bend. At the bottom of the rapids, go between the big rock on the right side and another rock in the middle of the river. Island Rapids (Class II) follows. Stay to the left side of the island. There is an old logging boom between the right shore and the island making this route impassable. Fast, fun riffles follow. Flat Rapids are wide and should pose no problems. 3 miles downstream, at Pete's Landing, drinking water is available. Go right around Bear Skull Rock standing in the middle of the river about 3/4 mile downstream. Shoot the center of the small rapids that follows. In the next 3 miles to Stangle Landing, medium-fast current and several rapids will be met. Quinn Rapids (Class II) should be run fast and through the center. The 3 pitches of Stub's Rapids (Class I) follows. Watch for a large rock in the center of the river below Stub's. Stangle Landing follows and is a possible take-out or camping site. A series of Class II rapids follows. The water is fast with lots of boulders to dodge. The first 3 rapids should pose no problems, but when in doubt…scout! At Pine Tree Rapids (Class II), run under the pine on the far left side. The Ledge is long, winding rapids. Take it to the extreme left. The river forks around 2 islands. At the first island, take the left fork and at the second island take the right fork. Beginning at the second island a rapid succession of 6, numerically named rapids, follows. Most are Class II. Sixth, Fifth, Fourth, and Third Rapids are easy to run, but Second Rapids has a thrilling drop. Take it to the left through the V First Rapids (Class II) ends the set. A 5-mile stretch of flat water precedes the take-outs at the City of Park Falls. The first take-outs may be made at the Park Falls Country Club on the left shore or the paddler can continue approximately 3/4 mile to the Flambeau Paper Company Dam on Hwy. 182 in Park Falls. Portage right at the Dam. Expert only Kayak or covered canoe. Note: This river route has not been officially surveyed and includes high hazard Class V rapids, dams and inaccessible canyon-like areas. Water levels fluctuate greatly since the West Branch is used for hydro-electric power generation. The river marks the boundary between Michigan and Wisconsin. During spring high water conditions, the West Branch can offer thrilling white water experiences for experienced kayakers. The river was the site of the 1985 Pan-Am white water competition. In summer, water levels are usually too low. The Montreal River Canyon is located on private property. Canyon walls are steep-sided and not barricaded or marked. Permission should be asked of landowners before entering this area. Paddlers should be cautioned that there is no land access out of the canyon once it is entered. Before planning a trip on this river, we encourage paddlers to contact a local canoe outfitter. The following map is for advisory purposes only and not intended to accurately depict river conditions or hazards! When the waterways are frozen, think of Iron County for winter-time fun! Over 200 inches of snow a year, a network of track set Nordic ski trails, four major downhill ski areas, and over 450 miles of groomed snowmobile trails. Plus, communities that sparkle with après ski fun! Contact us for more information.